Are you interested in learning more about local food systems? Do you work with local food projects, but are unsure of the research about their impacts or the resources available to support you? If you answered yes to any of these questions, you might be interested in N.C. 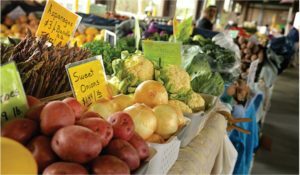 Cooperative Extension Local Food Program’s new online, non-credit professional development certificate course, Foundations in Local Food Systems Development. This course is a part of the new Overview of Local Food Systems training program. This program is designed for those who are just getting started in their local food systems career, or for those who have experience but want to gain a broader or more complete perspective. The training program is housed at NC State University, and is a partnership between N.C. Cooperative Extension, Clemson Cooperative Extension, and Virginia Cooperative Extension. Upon successful completion of the course, participants will receive a Certificate of Completion from NC State University’s McKimmon Center for Extension and Continuing Education. The training program will provide participants with an overview of local food systems research, activities based on North Carolina specific project examples, as well as resources to support translation of research into practice. After taking this training, participants will understand the structure and components of local food systems and will have developed knowledge crucial to collaborating successfully across disciplines to support local food system expansion. For more information, including registration, please visit our training program website, and see this LocalFoodsOnlineFlyer_032818. If you have questions about the training program, email the program directors localfoodncce (at) ncsu.edu.